Last summer I did a fabulous tour around Iceland to distribute my books to retailers. We drove the south->north route, and one of our first stops was at Seljalandsfoss in the south, one of Iceland’s most stunning waterfalls [it’s the one you can walk behind]. As it happened it was a beautiful sunny day [one of the few sunny days in a decidedly rainy summer] and a gorgeous rainbow had formed in the mist from the falls. 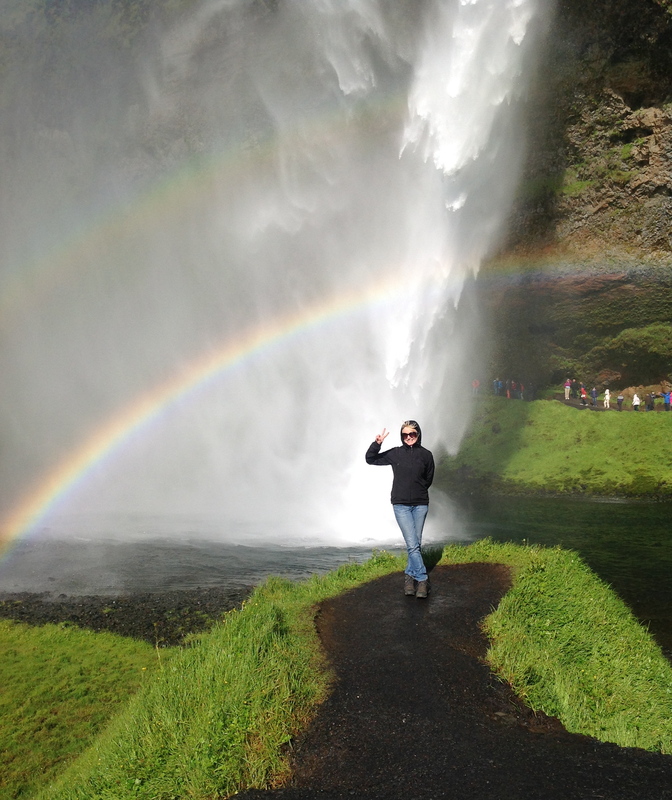 My daughter snapped this pic of me in front of it and on closer inspection we saw that there was not just a single but a double rainbow. Which just has to be auspicious, right? Much as I am pleased about the increased tourism to this country, especially following the economic meltdown, I must say that I was a little shocked at the sheer number of tourists we met going around the country. I had not done much travelling around Iceland in the few years previously, and though I had heard of the tourist boom and experienced it somewhat in Reykjavík, the number of people outside the capital was astonishing. Case in point: the line of people behind me, waiting to pass behind the falls. Just a few short years ago you could turn up in that location and be the only person there. Not any more. We regularly discuss Icelandic current affairs, including the tourist boom, on our Facebook page. Join us!